Every morning I wake up to a crow outside my window calling out what food is available in our yard to his fellow crows. His “Caw, Caw, Caw” I believe translates into, “We have the usual fare of peanuts, suet, and sunflower seeds here.” And then I hear his brother scout in the distance, “I’ve got a garbage bag full of chicken bones over here.” And a little further in the distance I hear another crow scout announce, “Ripe road kill over here, enough for all!” My yard never makes the morning cut for breakfast, but a scout is here every morning to check what I have to offer. The American crow is a large, beautiful, black bird that looks like it has iridescent purple feathers in the sun. Both sexes are similar. Its scientific name Corvus brachyrhynchos is Latin for "raven with a small nose." Their populations are just now recovering in mid Michigan from the first appearance of West Nile virus in the Western hemisphere in 1999. Their susceptibility to the virus made them a useful indicator of the West Nile activity. 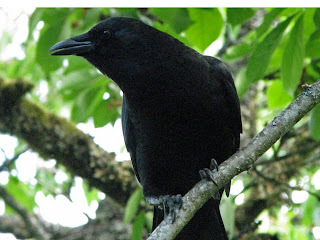 However the American Crow is still often reviled for being a large, loud, messy, scavenger of garbage even though crows are one of the most intelligent birds around. A group of crows has many collective nouns, including a "cauldron", "congress", "horde", "murder", and "muster" of crows. They are very social animals and interaction with other crows is very important to them. The average crow lives for twenty to thirty years. They have close family groups and usually mate for life. Juvenile crows typically leave their family at 3 to 4 years but will still return to visit. As members of the corvid family, crows are considered to be among the most adaptable and intelligent birds in the world. They can mimic the sounds made by other animals, and they learn to associate noises with events, especially with the distribution of food. They work together and have shown the ability to construct and use tools. I saw a great television show 2-3 years ago about the high intelligence of crows and was amazed.